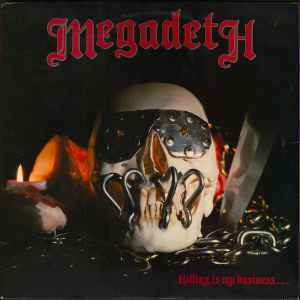 Megadeth ‎– Killing Is My Business... And Business Is Good! My copy has the same label and runout, but did not come with a printed sleeve. My copy has poly. Original owner. Anyone else have two identical inner sleeves (lyrics on each side of both)? Sounds ok, the instruments are pretty solid and I've heard some melodies I had never noticed before. Tracks are not in correct album order on lyrics sheet. Also for the song KIMB, three lines of lyrics from Skull are inserted after the line "$10,000 up front", starting with "And as we fold your arms". My copy (from Pledge Music) has two Side B labels on Record one. Is this a common mistake? If somebody wants to, this should be edited to say REMIXED, also. It says so on the front sticker and in the press release, I think.